When I think of the Toronto arts scene, there are a bunch of names that pop into my head – but you better believe that Anne-Marie Woods’ name is right up there! She has been hitting the stage hard since she left Nova Scotia and moved to Toronto in 2000. Anne-Marie or Amani as some may know her, is beyond a triple threat. She is an actor, dancer, singer, poet, producer, arts educator, playwright and creative consultant. She clearly is the definition of a hustler. In late 2015, Anne-Marie and I spoke about her work on a new play that she scripted called She Said/He Said. While the title suggests that the play focuses solely on relationships, Anne-Marie assured me that it also delves below the surface and exposes some deeper issues between men and women. The play is a combination of real stories and fiction. So far the play has been performed in select cities and has been described as a theatrical rhapsody as it is theatre combined with spoken word, song, movement and poetry. For the Toronto run, Anne-Marie plays the title role of She, and Mathew G. Brown (a Dora Mavor Moore Award winner) plays the title role of He. As Anne-Marie and I got reacquainted (BTW – we met YEARS ago, but can’t remember when and where) we spent considerable time talking about her play, but we managed to spend a good chunk #girltalking about dating in Toronto. Anne-Marie shared with me that it is “difficult dating in Toronto” because men and women don’t really communicate effectively with one another. Being an outgoing person from Nova Scotia, she is used to talking to everyone she meets, so finds the lack of interaction surprising. This lack of communication is something that will be touched upon in her new play. To find out more about Anne-Marie and her play, keep reading. What motivated you to write She Said/He Said? I live in Toronto! That’s it! Just kidding. I’ve lived here now for 16 years, and after living here for 4 years, I was perplexed by the lack of communication within the black community. I grew up in Nova Scotia…even if you didn’t know somebody, you’d say hello. It’s not so much a societal thing here where every black person says hello to you. It does happen on Eglinton West, but growing up in Nova Scotia, I’m used to the formalities. It bothered me that I’d say hello to a man and they wouldn’t speak. It really bothered me. I wasn’t asking them out, I was saying hello! That’s why I started Blingles in 2004. I was getting tired of having the same conversations, so I was trying to do something about it. I hosted events that brought people together in a fun environment and got them to talk. We dealt with a lot of topics. We’d talk about being single, interracial relationships and dating. By doing Blingles I learnt that black women and black men in Toronto feel the exact same way, but are not communicating with each other. For example,women felt that men did not acknowledge them and some men felt that women scrutinized them too much. What was the process like writing She Said/He Said? 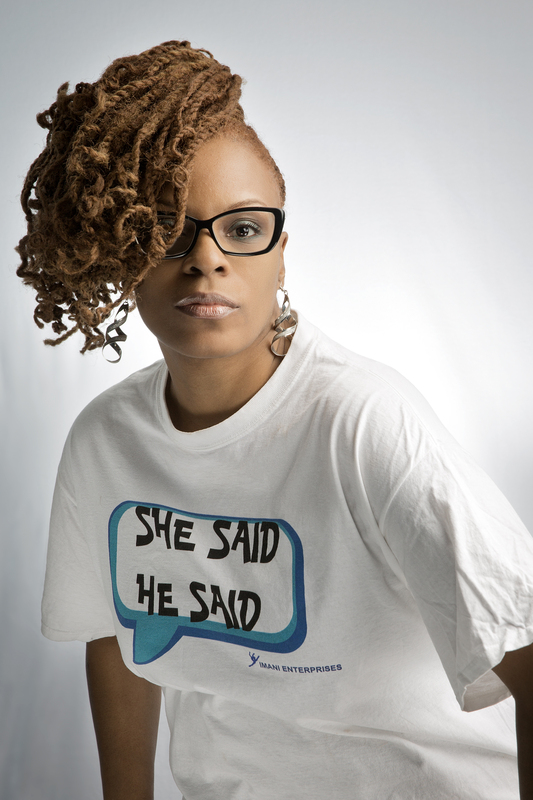 The first time I wrote monologues was in 2006 – then it was called He Said/ She Said. I presented it at the African Canadian Playwright festival. Shortly thereafter I got injured and my transition went from theatre to focusing on teaching and then to focusing on consulting. I left the theatre world in 2006. I didn’t look at the script since then. In 2012 I dug out my old script for He Said/She Said and started to work on it when I had down time. I added to the script and finished a version in 2014. It got into a festival in Nova Scotia the same year and it was well received. It may have started from a very personal place, but evolved into these two characters – She and He. It’s about two people who are looking for love. They think that they are ready to meet the right person and when they do, it triggers issues they didn’t know they had from previous relationships. With She Said/ He Said, I initially wanted to show the difference between what men and women say versus what they hear… but you can only take that so far so it later became a story based on She and He. What would you like the audience to leave with? I want this play to open up conversation. To let people see some of the things that I see happening in Toronto reflected back at them and get them to think about it and then talk about it. The good thing about this play is the conversation that comes after. It is so awesome and so needed. I feel that it is better than Blingles because I am putting something on stage and it’s not just black people that relate – it’s everybody! I can’t wait to do it here. Thank you Anne-Marie for creating a powerful piece. Can’t wait to catch it. Location: Native Earth AKI Studio – inside Daniels Spectrum, 585 Dundas Street E.